Upper hutt summer carnival 2019. A group of club members attended the Carnival and showed off between 10am - 3pm a variety of activities: agility, RallyO, obedience and Flygility. We also did a CGC walk. Moehau Park, accessed via Moehau Grove off Holdsworth Ave.
Do NOT park in Moehau Grove. Parking for members is available on shingle car park area just past the club rooms. 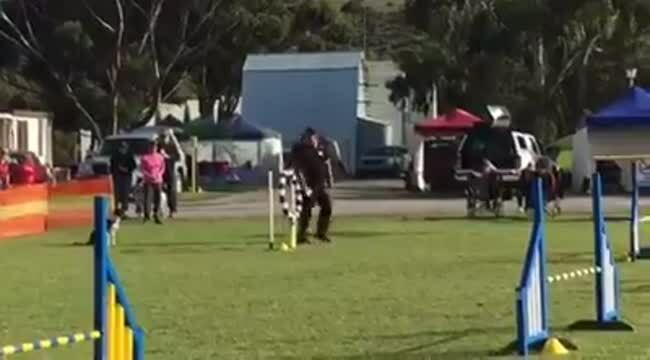 Saturday February 24th a group of 13 Upper Hutt members attended the Upper Hutt Summer carnival with their dogs. The carnival is a great place for a dog event as there are so many people coming through during the day to enjoy the dogs running around the various courses, and there is ample time to chat to people about their dogs and encourage them to come along to the club and enjoy the variety of activities we do there. It is also great for the dogs as they get to run with all sorts of distractions including people with food, flags, bagpipes, foam bubbles blowing through to list just a few! This was held on Thursday 22nd February in the Green room at Expressions in Upper Hutt. The reason for going here was because our old club rooms had been moved and they werent ready to be occupied fior this meeting. We all made it up the many flights of stairs and had a pleasant evening, electing a full committee. Committee: Anneke Lilley, Gillian Cruickshank, Jane Aukett, Karen de Wit, Sue Boyle, Donna Tofts, Fiona Turner, Erin Mulholland. For reports, go to the Offical Documents page. This was held on Thursday 16th 2017 from 7pm at the Club rooms, starting with the awards ceremony. AGM matters included a proposed name change, new constitution and a slight increase in Subscriptions. Read the Minutes from the AHM here. Committee: Corinne Reid, Sharon Hastings, Blair Hastings, Karen de wit, Gillian Cruickshank, Anneke Lilley,Jane Aukett, Kathryn Bayne, Erin Mulholland, Brent Packwood, Karen Sadler. It is proposed that this be increased from $30 single ($50/family) to $32 ($55 per family) to reflect ongoing increased costs. PASSED. It is proposed that the name of the club be changed to "Upper Hutt Dog Training Club" because that more accurately describes what we are. PASSED. Enrolments can be done via the form on the website. Click here. If you are interested in Petdog essential skills, obedience and rallyO classes these are held on Tuesday evenings. to be attended by all enrolees for Tuesday night classes. NO DOGS FOR THIS MEETING PLEASE. This presentation will cover care and protection of our dogs, dog control policy, club etiquette, what to bring to every class and a review of what we will be covering in term 1 of our Essential Skills programme. We will show you how the Essential Skills programme is the foundation for all other activities UHDTS offers, including CGC, obedience, agility, rally, flygility. If you are unable to attend on the 31st then we will take you through the presentation on the first training night (7th Feb). Please leave your dog in the car until the end of the presentation on that night. First training night with dogs is Feb 7th from 7pm. This was a great seminar and all puppies and handlers went home very tired and slept well!! Puppies need to be played with - tug toys are great and it needs to be something the puppy likes. Dont push the toy into the puppy's face but let it chase the toy. Tell them to "get it". Interact with them, tap their sides and legs etc. Let them win more often than not and tell them how great they are to win it! (They will become less enthusiastic if you always win). Throw the toy, then turn and get them to chase you! This is the best way to get your pup to interact with you and not to just run off with another dog or anyone else. Food is good too. Toss food one way and then another way (make sure they can follow where you threw it). They will look to you for rewards. Use all their food to train them. Get them to look at you. Dont use pup's name unless they are looking at you/coming towards you, just use squeaky noises and "pup,pup,pup" to start with as want their name to cause them to come running ! With a toy get them to "give it" and to "get it". Use rewards to help shape behaviours. We worked on sit in a box and down on a mat. We did restrained recalls with pups and they were great fun! Left: Some pictures from the day. Quick and Ali and I thoroughly enjoyed our trip to Adelaide for the last two weeks. It was great and worth all the organisation, time and effort to make it happen. We had thrills and spills aplenty, the trailer incident certainly shook me up. I think I could write a book on how to get a dog to Aust and back again now. Being part of the Paw Blacks and having a supporters group that came for the trip was a fantastic experience. I feel like I have been away for a month! The attached video show Ali’s winning run in the Open Jumpers Class, beating over 300 dogs! Ali was a star for the two weeks. Winning the Open Jumpers Final at the national is the obvious highlight. She placed 2nd in Masters Gamblers on the same points as the winner, and won a Masters jumpers heat. The weekend before the nationals she scored 104 points in winning gamblers, which is a huge score. She also won another gamblers and came 2nd in Snooker. She placed 3rd in the Open Jumping Final. And she placed 3rd in the Masters Agility final. Leading up to that she won a Masters agility heat and placed 2nd in another heat. Quick was 4th in gamblers. She also placed 6th in all three masters jumping heats. The weekend before the nationals she won a Masters agility, a masters jumpers class and an open agility class. One of Ali's runs in Australia. Ali jumps up after a successful run. In June, seventeen club members stuffed these Club flyers (rack cards) into envelopes destined for Upper Hutt dog owners. It was a great fun hour or so activity, followed of course by coffee and cake! Welcome to you all, I would like to thank you for taking the time to be here at our AGM. Firstly I want to acknowledge, members who have lost loved ones throughout the year, our heartfelt condolences, and to the members who sadly departed this life – our thoughts will always be with you. I pay special tribute to our Life and Committee member Sue Tyson who sadly left us this year. Remembering Sue’s numerous club contributions, the considerable time Sue spent as our Obedience Show Secretary, competing, training, committee and social. She loved have wine and chat after each show. Her unique personality will bring a smile to our faces for many years to come. Sue was a much loved and respected member of the club, a valued Committee member and a good friend to many, and is greatly missed. As it is each year this club would not run and achieve the things that we achieve without the help, input and commitment of our committee and dedicated instructors. It has been a pleasure to work with you all this past year. And I would also like to add that without our members who also do contribute to the running of our great club, without all of you we wouldn’t have this great club. WELL DONE!! The Club appreciates your efforts and I would encourage others to give it a try, you could be surprised how much you have to offer! Website and Facebook page, many thanks to Karen De Wit, Sharon Hastings and Anneke Lilley for setting up and managing our club’s website, Facebook groups and pages. Special Thanks must go to Gillian Cruickshank, Sharon & Blair Hastings, Karen De Wit and Kat Bayne for managing and co-coordinating weekly training classes for RallyO, Domestic and Competitive Obedience, Agility and Flygility. We have once again throughout the year run very successful trials, in Obedience, Rally O, Agility, and Flygility. To all those members that have achieved with their dogs and put in the effort and dedication it takes to get our dogs to these levels of achievement, congratulations. I am positive without a doubt that the year ahead will be even more successful and fun than this. Good luck and continue to enjoy your dogs. Our treasurer‘s report shows a healthy balance sheet which demonstrates the good work and the professional approach of our current committee. Our successful year has not been accomplished without some hard decisions; we have made these with the best interests of our members in mind. With the relocation of the club still looming it’s has been important that we have been frugal with spending. The Relocation has been hanging over the head of the club for some 3 years. The Upper Hutt City Council has been supportive in actively suggesting ground options for the club. Your committee has reviewed all of options and this stage the preferred one is Moehau Park. (The Old Pony Club Grounds) The current situation is the Upper Hutt City Council cannot move forward with our relocation until they have finalised the process of disposal of the land at Maidstone Park. Their approach regarding the disposal still has to be decided but we have been assured that is not too far away. (Their words) I believe we are finally approaching a crossroads with decisions to be made for the future of our club. While Agility group is very strong I would have to say that I have concerns with the state of Obedience group. Over the past couple of years the competing Obedience members have become detached from the club. I hope the incoming Committee make it priority to address this issue. I have feeling that without Gillian Cruickshank’s passion, Rally O may go the same way. When the club has people with passion like Gillian’s things happen. Our challenge as club is to address this issue by having good succession management that provides good support for both the current and new people. This will need to be unpinned by a solid 5 year strategic plan that will work out more ways to improve our club in the future. In closing, I’d like to thank the Club members for the honour of being President last twelve months. I wish the incoming Committee all the best and I am certain you will show the same commitment to make sure the club has another successful and enjoyable year. Please remember you don’t have to be on the committee to offer your help. Thank you once again to everyone involved in making Upper Hutt Dog Training School a club to be proud of. The continuing growth of our Club can only be achieved by the support and patronage of our loyal members. 2015 was a busy year for obedience, all classes were full, we had 5 instructors taking the domestic classes. I would like to take this opportunity to thank them all for the great job they did. They were Blair Hastings, Adrienne Marfell-Jones, Jenny Marks and Corinne Reid and myself. Without these trainers there would be no domestic classes. We have 10 in the competition class which is taken by Karen Sadler who also takes the Junior handler classes on a Tuesday night along with her helper Darren Lilley. The Variety class is proving to be popular we even now have people asking if they can join. We have sent a few onto the agility foundation class and about two more are due to start. During the year one of the dog clubs life members Sue Tyson pass away, Sue was our test secretary for our Obedience Show and she ran that with an iron fist. If we didn’t do as we were asked we were in trouble. Thanks to the guys that took it over at short notice Karen Groombridge and Karen Sadler. Sue also competed in Obedience and loved it. Sue will and is missed by all that knew her. Agility classes run on Wednesday night. On average we have about 25 people training each week. At the beginning of 2016, in response to a survey sent to club members, we began a 5.30pm agility class for advanced competitors, and changed the other time slots slightly. Training indoors at RDA over winter went well again. The weather late in 2016 was poor at times, with only one week in November being suitable for training!! The aim this year is not to postpone, and whoever turns up will train if they wish or stay and have a coffee!! We held a Dyson Beasley seminar in September and in February which gave club members some extra training, and Anne Packer and Donna Tofts held an intensive weave and contacts training days at the beginning of the year which went down really well. Kim Nicol and Debbie Shute also ran some extra training before NZDAC. We have had some awesome instructors over the last year and hope that everyone appreciates the effort these people put into the Club. They are being given discounted training fees for each term they instruct as a thankyou. NALA. Our Club’s support of all forms of Link continues with people enjoying beginners, Veteran, Games and normal Link. We have had a few good months and hopefully a few members will receive ribbons this year. Thanks to Jane the Junior Link section of NALA is still going. Our events continue to be well-supported. We continue to make a good profit on most events of around $1000. We continue to run 3 rings which spreads our helpers thinly but everyone still seems happy with that concept. We continue to offer a mix of classes – agility, jumpers and games, which is fun. The coloured ribbons make people happy. The Club also backed the games day at Horowhenua and the one to come at South Rangitikei. Our September event was no held due to dreadful ground conditions. It was moved to January and run then. The increased workload involved as a result of postponing caused me to say = never again! Several club members have performed well with their dogs over the year, gaining clear rounds, going up the grades and gaining awards and titles. We have a few more Champions at the club, whose photos will adorn our club walls. Congratulations to Kim and Billie and Celina and Riot who both made their dogs up to Agility Champion in February. Peter de Wit and Ali became Agility Grand Champions early this year. Donna tofts and Fern were top JC & Medium dog, and Peter de Wit shared top Maxi dog at NZDAC. They were also in the winning Inter-Zone team which retained the shield. End of year prize-giving was held, the recipients were:- Starters = Chico, Novice = Fergus, Int/Senior = Ali, JC = Cash, JB = Billie, JA = Ali, Games = Holly, Junior = Margaret Lilley, Most improved dog = Cash, Top dog = Ali. Next year these will be presented at the AGM. Pete and Ali also won a Zone award. EQUIPMENT. Our equipment continues to increase in number. We sold off some old tunnels and spread jump. Two dogwalks will soon be added. During the year a short tunnel was added to assist foundation and variety classes. COMMUNICATION. Communication of various types is continuing via Website, Facebook and email. We started to use the Activation page in the Leader this year which is a free one, and have organised flyers to go in Dog Registration packs this year. We can always do better but hopefully most people know what is going on from week to week. NEW IDEAS FOR 2016 include:- Coffee morning agility, ribbons for each height at events etc. Finally, thankyou to everyone who in any way has helped with agility at Upper Hutt. We have a great club spirit, so let’s keep it up! And remember – Before you complain - have you volunteered yet? Another successful year with numbers fluctuating throughout reaching a maximum of 11 and with a consistent group of 5. During the year some club members earnt titles including Paige Aukett and Bobby RN while others continued to work towards gaining higher titles. We have continued with Link throughout the year and have run a couple of fun nights and had a couple of meals out. I am stepping down from taking Rally O and as two of the girls want to pursue obedience rally o is stopping at this point. Darren suggested that Corinne get clarification regarding the asset register as it doesn’t read right. Report not approved until it has come back from the Auditor. It needs to be back and approved by the 31st March. A special meeting will be called. After a discussion it was decided that we would keep the prices the same with the exception of the Junior Handler that will change to $20 if they are members without a parent. Our open night on 3rd February was our first one, and it was a success with everyone signing up to join the Foundation agility class. The Juli Walters seminar was a great success, with over 12 people attending a very informative evening, made even more pleasant by nice warm club rooms and some yummy food. Juli talked about jump heights and takeoff/landing stresses on the body of the dog. She ran through some common injuries found in agility dogs, and outlined the signs to look for during an assessment of lameness, and the route to recovery. She focussed on two common areas = back pain and iliopsoas injury. Prevention of reinjury includes:- warmup and warmdown strategies, a look at jump heights and thinking about competition goals. Thankyou to the Agility Committee for providing funding for this seminar and the handler injury prevention one. Evening session will discuss: Signs of injury, what to do about it, recovery and rehab including some good exercises to help strengthen your dog. We will be offering this again. See the Agility page for more details. It was decided that we would elect someone from the committee later. Sue: Are we going to change the subs. It was put to vote and they would remain at $30 per person or $50 for a family. A great day for Kate Dickinson at Feilding obedience champ show today, winning both specials on qualifying points, and being awarded the Central Region Sash for the YKC member with the highest points through 2014. This was held at the Club grounds on 14th March, in conjunction with DAWG. Weather was great! Picture shows Wayne and Sharon in the Beginners lineup with Cash and Zed.